I don’t know about you, but I can’t WAIT to get my hands on some Irium! 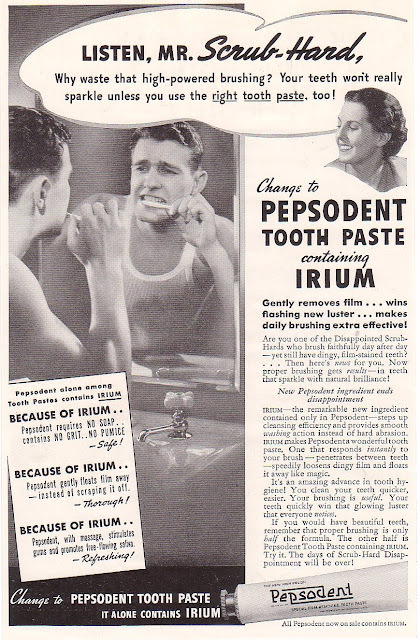 This was a time, apparently, when advertising some random and mysterious ingredient in your product was a GOOD thing. I have to say that the guy brushing his teeth… seems absolutely pained. I guess that’s why he needs Irium? Lovely blog(s)! This one’s my favourite though, I absolutely share your love for old adverts/ graphics. And you have a great collection! All of them are making me smile, and google random historical tidbits; I mean, in 1994 the then FCC chairman said that the irium advertised here was completely bogus. Sheesh! Thanks for dropping by The Delhi Blog! These photos are great… Good blog Rob! No soap? Darn it. Brushing one’s teeth without soap is like knitting without yarn.